Everything you need to know today about Python Packaging: PEPs 517/518, pyproject.toml, Pipenv, setuptools, and—of course—pip. I recently gave a talk at the Christchurch Python meetup which discussed the strengths and weaknesses of shell scripts, and why you might want to consider using Python instead of shell scripts. I went into some areas where Python is arguably worse than shell scripts, and then we dived into the excellent Plumbum package which nicely addresses most of those weaknesses. Nuitka is a Python compiler I never heard of. It just achieved 3.7 compatibility. Cool! > Right now Nuitka is a good replacement for the Python interpreter and compiles every construct that all relevant CPython version, and even irrelevant ones, like 2.6 and 3.2 offer. It translates the Python into a C program that then is linked against libpython to execute in the same way as CPython does, in a very compatible way. > It is somewhat faster than CPython already, but currently it doesn't make all the optimizations possible, but a 258% factor on pystone is a good start (number is from version 0.3.11). balduin, know and Daniel Sheffield like this. Marco R. and Maurice LéDuck like this. A small #python library to create very simple command line interface based on argparse from function definition. Éric, Christopher Rozruch and ZONINOZ like this. Some are not really essential at all here, but most are good every Python coder should know things. In this post, we've shared essential Python tips and tricks that aimed to optimize code and reduce coding efforts. Hope you all would love it. You’re head down, working on a new project and one of your dependencies still doesn’t support Python 3 — argh! Last year, we did a recap with what we thought were the best Python libraries of 2015, which was widely shared within the Python community (see post in r/Python). A year has gone by, and again it is time to give due credit for the awesome work that has been done by the open source community this year. Again, we try to avoid most established choices such as Django, Flask, etc. 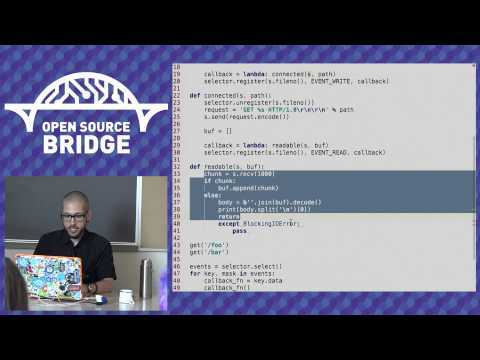 The Open Source Bridge conference recently published this video of me building, in barely 30 minutes, a Python 3 async framework. Run external process asynchronously with Pytho, GLib. Get stdout and stderr via signals. Tim Golden's Python Stuff: Win32 How Do I...? The idea of this page is to answer various of the How Do I...? Python Koans is an interactive tutorial for learning #Python by making tests pass.